What has no thumbs and travels at the speed of light, to within experimental uncertainty? 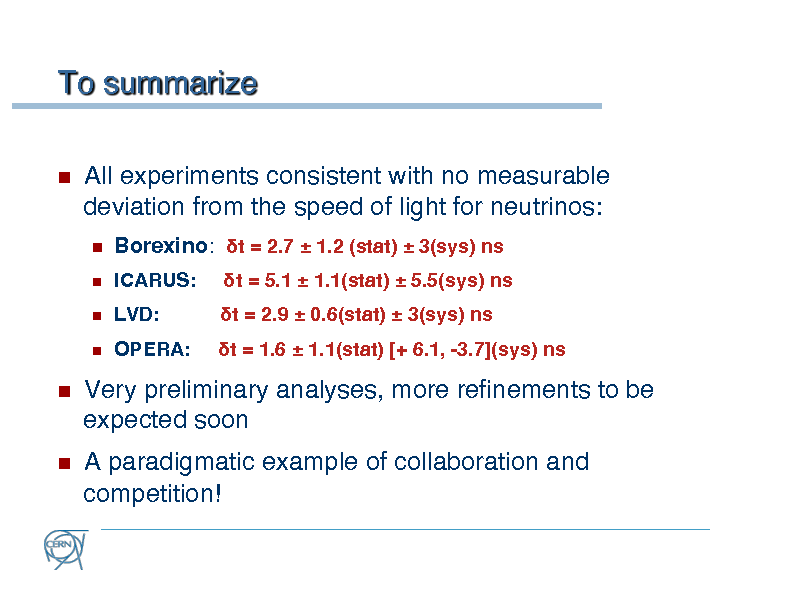 I will just say this right away, the Borexino, ICARUS, LVD, OPERA, and MINOS Experiments have all independently found, within experimental uncertainty, that neutrinos travel at the speed of light. To enlighten, last September the OPERA Experiment at the Gran Sasso Laboratory, in Gran Sasso, Italy, observed what appeared to indicate that neutrinos travel faster than the speed of light. (More information available from veteran QDers Aiden and Seth). The reported quantity is time it took neutrinos to travel from CERN to Gran Sasso minus the time it would have taken light. I should also mention that the statistical (stat.) and systematic (sys.) uncertainties are incredibly important. 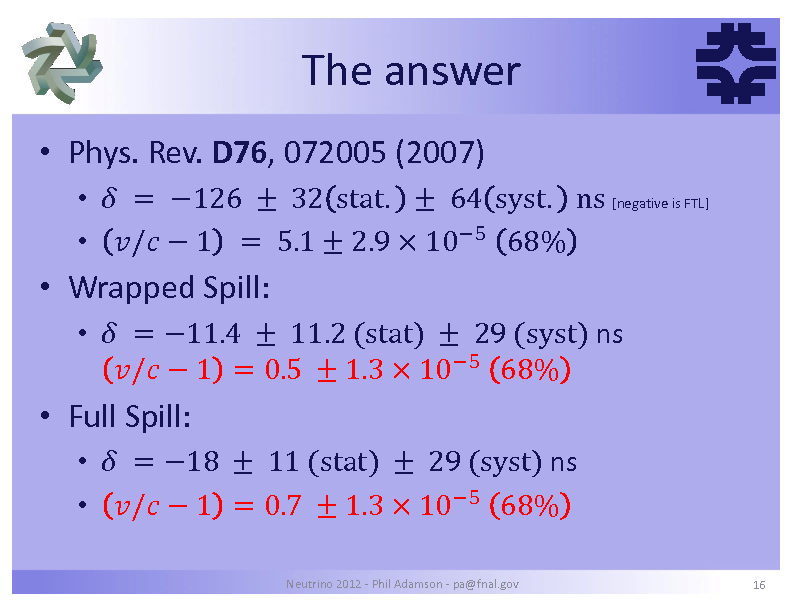 To clarify the situation, this result was not a typical “Hey! We discovered new physics!” result. Had OPERA correctly observed a massive particle traveling faster than light, then we would truly be in the midst of a physic revolution. That is not a hyperbole either. As a result, everyone, theorists and experimentalists alike, put on their scientists hats and scrutinized the result to no end. Much drama ensued and at long last the problem has been resolved. The issue at hand were actually two very subtle effects that worked against each other. 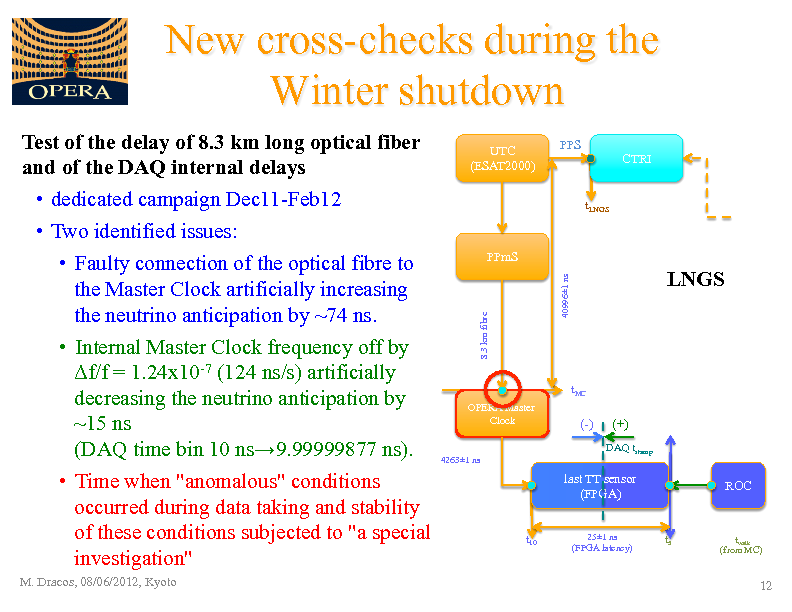 The first was that a 5.2 mi (8.3 km) cable was accidentally stretched back in 2008 and systematically introduced a 74 nanosecond delay in the system that recorded the time the neutrinos arrived at the detector. The second issue involved the highly precise master clock system for the entire experiment; it was slow by about 15 nanoseconds. 74 – 15 = 59 nanoseconds was exactly how much sooner the neutrinos were arriving than they were expected. In conclusion, neutrinos may still travel faster than the speed of light. It is unlikely, but still possible. Officially as of today, though, we know that all measurements of neutrinos’ speed show are consistent with the speed of light.